PHP is Server Side Scripting Language used for writing software for a wide variety of applications. It was created by Danish-Canadian programmer Rasmus Lerdorf in 1995 and in recent years has become the most popular scripting language. Some of the main reasons why it is so widely used are that PHP is relatively easy to learn, free, and runs on all major operating systems and web servers. Furthermore, the most popular PHP frameworks have significantly evolved in the last two years. PHP Frameworks are an easy way to use PHP Increase efficiency and security, shorten development time, and make code lightweight, which will make it run faster. Also, you have functionalities like CRUD created automatically so you won’t waste time on base structure. Moreover, PHP Frameworks let you recycle your code for future uses where you will only need to make slight modifications, instead of starting all over again. However, here comes the tricky part: how to choose the right framework? We have developed a comprehensive infographic to help you through the process of selecting the best framework for your needs. Symfony, along with being one of the most used PHP frameworks, is also a community of developers who maintain and expand the project pro-actively. One of its advantages is that it is built in a way which compels you to use best practices such as having an organized structure for your files and folders. That makes the code easy to maintain and readable to others. The framework is also very modular – there are many functionalities that can be added to the ones you get out of the box. 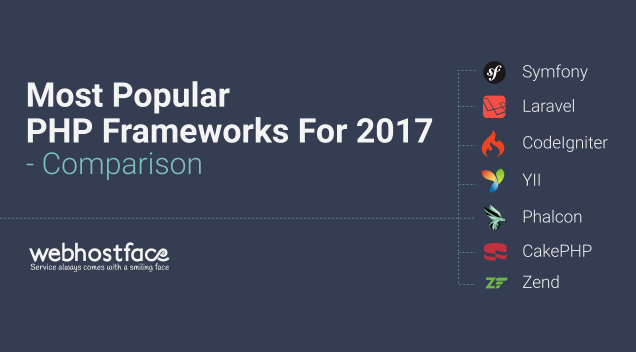 Laravel is perhaps the most used PHP framework in 2017 so far. One of the main reasons why it’s so popular is that in addition to being very simple it’s documentation is very well structured which eases the learning process. It’s Eloquent ORM is very handy as it almost removes the need for SQL language. By default, it comes with many included functionalities and it is partially built using Symfony. It also uses Blade templating engine which simplifies the code syntax and makes it very convenient to work with. YII is one of the fastest PHP frameworks due to its usage of lazy loading technique. It also has layered caching scheme which caches dynamic pages and data. Released initially in 2008 and being completely rewritten in 2014, it has extensive documentation. YII’s developers and contributors provide great support to its community. It comes with jQuery integration and many AJAX features. It also has compatibility with other frameworks like Zend and Pear. Phalcon is considered the fastest PHP framework which consumes very little resources and has low overhead. It’s written in C and C++ and comes as C extension, optimized to deliver performance while it’s functionality is exposed as ready-to-use PHP classes. Phalcon will allow your project to do more for its visitors as they’ll have to wait for less for each request which also makes it very efficient. CakePHP is one of the first PHP frameworks and thanks to that have amassed a great community. It doesn’t require XML or YAML files for its setup which indirectly eases the development process. With Cake, you’ll be able to create prototypes and reusable code rapidly and it also comes with a templating system which is highly customizable. Zend is a very robust, widely used, and well-developed PHP framework. Among the other PHP frameworks, it’s the most popular when it comes to enterprise software for big businesses. It is developed by the people who maintain the PHP language themselves and as such is sure to stay on top for a long time. Ready to get started with your new PHP project? 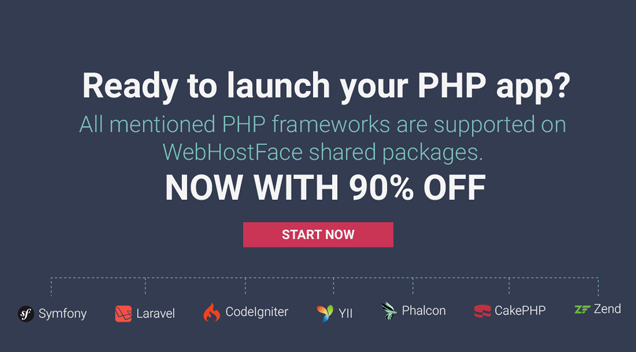 WebHostFace supports all these frameworks even on Shared Hosting! Get started now! Iva is an opinionated and witty read-head. She's got various interests – writes music reviews, takes pictures and loves French. Her idea of happiness is to be able to travel to lots and different places – meeting interesting people along the way. She loves the opportunity to speak to people from all over the world and her job gives her just that. ← What is WannaCry ransomware and how to protect your computer? Great Infographics, I am new to PHP soon i will learn Laravel.. This is a nice list. I really like Laravel, but it seems to be quite slow. I have a lot of experience with CodeIgniter and I think it is funny that it is always presented as its greatest benefit that it is easy to learn for beginners. Well that is true, but as we can see in the infographics it is also very fast, only beaten by Phalcon, that is using C++ DLL’s to process PHP and is not everywhere easy to install. I am surprised that everyone is hurrying to learn Laravel (which is a very nice framework), but it is the slowest processing framework of them all. That is odd if you see that there are so many articles written about the need for speed. I do know that you can learn old-fashioned CodeIgniter in a good afternoon. But it is a fact that CodeIgniter is missing some nice features that Laravel has. But then again, it is all PHP under the hood. I use Codeigniter for years, i love it , many times i decided to learn laravel, but codeigniter is super easy and super flexible, i will try symfony but laravel not yet. For small projects, we really enjoyed working with Laravel but it fell apart when building a moderately complicated data handling application in the accounting domain. I love how it is re-popularizing PHP now that 7 is being adopted but I think it has a lot of the weaknesses that Ruby On Rails had a few years ago before Ruby adopted a VM runtime to improve performance. We moved to Phalcon after that project fell apart. I find installing DLL’s to be pretty difficult in general but on Linux and macOS it’s pretty much a no brainer. This is a big win given you will likely host your site on Linux. I think CodeIgniter is still around for a reason. It’s traditional, well understood and a good balance of features to speed. One of the places I think we should be looking is PHP-FIG changes regarding JIT. Phalcon’s speed comes from the Zephir Language which makes building PHP C extensions super easy. The underlying problem is speed is OOP can be heavy in interpreted languages. Just like Ruby, transitioning the runtime to JIT had a huge speed boost the thing about Phalcon is it will only get faster with JIT and the rest of your runtime can be compiled. Very exciting times! How do you evaluate ‘learning ease’ in the chart above? The ‘learning ease’ graph is evaluated by the amount of components and features, and the amount of “stuff” a beginner has to learn to be able to use the framework effectively. For example, Symfony has the steepest learning curve of all PHP frameworks mentioned here due to its abundance of features. Yes, there are a lot of guides and a large active support and development community which helps but Symfony still stands as the hardest to learn. How do you evaluate ‘speed’ in the chart above? The speed of the frameworks is evaluated through a series of benchmark tests, as well as analysis of the technology that each framework uses. For instance, Phalcon, which is considered the fastest framework, is written in C, a portable assembly language, which is executed as direct machine instructions, with no intermediate layers, which makes it work much faster than other languages. Another example is YII’s usage of lazy loading: a technique, which initiates an object when you need it (instead of loading everything at the same time), which increases performance speed if you have many components. Each framework uses its own technique of increasing speed, which has been mentioned in the descriptions. Why Symfony is more learning ease criteria is more than the CodeIgniter and Laravel? Is there any specific reason for that? Symfony has the steepest learning curve of all PHP frameworks mentioned here due to its abundance of features. That is why it is the hardest of the PHP frameworks to learn as a beginner. I am a beginner in PHP and after reading about all those frameworks in this infograph I’am confused and not able to decide which framework to choose. Can anyone suggest which would be the best for windows operating system. Given that you are a beginner, you might want to start with Phalcon or CodeIgniter, which are easier to learn due to the relatively small number of dependencies and the abundant documentation, available online. All PHP frameworks will work on a Windows computer ( I presume you are talking about your local PC), however, if you plan on going into PHP development, I would personally advise you consider Linux, as it makes installation and the development of components easier. Yii is a modern PHP framework used for developing web 2.0 application. It is open source web application framework written in PHP5 that enhances the rapid development. It can be used for developing any kind of web application. You have designed a good infographics which depicts a very useful and helpful information. Your blog is very nice… Thanks for sharing your information..